Have you spent a lifetime dreaming of making it big and leading your hometown team to the Super Bowl? You're not alone. Sure, plenty of people are interested in criminal justice careers. Across the country, though, what kids are really hoping for is to make it big playing in the National Football League. Grown men plant themselves in front of the television or in the stands, shouting and screaming for their favorite team all while wishing they were part of the action. Football is a way of life for millions of Americans, so of course you'd hate to miss your next Super Bowl party -- unless it was because you were actually working at the biggest football game of the year. The good news is, you don't have to be a star quarterback or a bone-crushing linebacker to make it in the NFL. Career opportunities abound within the sport of football, from marketing to management and yes, even criminology-related fields. Believe it or not, you can work in criminal justice and be part of the action on Sundays in the fall. The NFL secures the services of civilian contractors to provide all manner of services usually found in the criminal justice industry. The main goal is to ensure the safety of the NFL players, coaches, and staff, as well as the fans. Players may also secure their own security agents, but the teams want to be sure that they protect their investment. One of the primary jobs of an NFL security contractor, then, is to keep the player out of trouble and out of the negative spotlight. While players have plenty of adoring fans, they also have their detractors. This is especially true when they are visiting a rival city. While the players are out and about, they may find themselves in positions where they need the protection and advice of an experienced security professional. 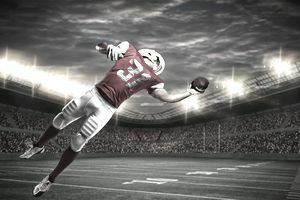 In short, NFL security agents are responsible for the overall protection of the physical well being of the players as well as their professional reputations. Ultimately, the list of their duties is long and varied. It can include nearly anything that relates to the protection of the individual or the team as a whole. NFL security contractors are very often current or retired criminal justice professionals who have significant experience in the area of security and investigations. They are usually employed as police officers or detectives who perform double duty as security professionals in their off time. Experience in the field is most often required for people to be able to work in NFL security jobs. Those interested in working with the NFL in this capacity would do well to get specialized training in the are of dignitary protection. NFL security officers are individual contractors and private investigators. They are most often affiliated with a local private investigative or security firm. In some instances, these firms may be comprised of a group of local police officers who contract their services out in their free time. NFL security agents do not receive a salary or benefits. Instead, they are paid an hourly rate. These rates are set by the individual contractor and are agreed to by the team. Rates for NFL security contractors can be $50 per hour or more, depending on the services provided. Working as a security agent for NFL players or teams can certainly be fun and rewarding, and may offer a lot of opportunities you might not otherwise get, such as going to the Super Bowl or being on the sidelines with your favorite team. At the same time, though, it's a job, not a vacation. Long hours and travel may be involved. Additionally, because services are contracted out, you will likely need other sources of income or another job. Working as a security professional for the NFL may very well be an excellent source of supplemental income for those already working in criminal justice careers.